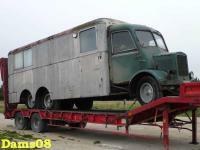 AEC » Matador MkIII / Mandator MkIII "Tin Front"
The first noticeable change in the exterior of trucks was made only in the mid-50s with presenting of updated cab "Tin Front". These cabins were used on all AEC range, including the third generation of Matador MkIII / Mandator MkIII. The trucks with these cabs received the codes 3481, 2, 3, 4. The "Tin Front" cab was differed by smoother shape of the front part, with a big grille and integrated round headlamps.